Why should we listen to celebrities like Bono or Angelina Jolie when they endorse a politician or take a position on an issue? Do we listen to them? Despite their lack of public policy experience, celebrities are certainly everywhere in the media, appealing on behalf of the oppressed, advocating policy change—even, in one spectacular case, leading the birther movement all the way to the White House. 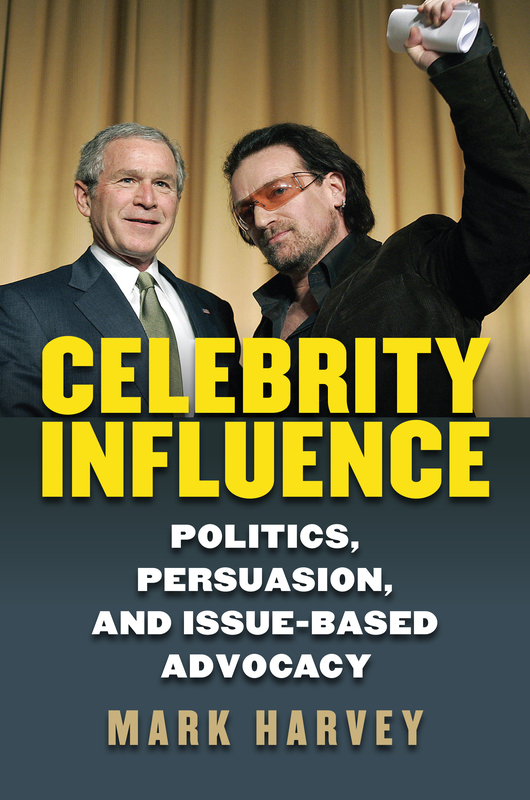 In this book Mark Harvey takes a close look into the phenomenon of celebrity advocacy in an attempt to determine the nature of celebrity influence, and the source and extent of its power. Focusing on two specific kinds of power—the ability to “spotlight” issues in the media and to persuade audiences—Harvey searches out the sources of celebrity influence and compares them directly to the sources of politicians’ influence. In a number of case studies—such as Jolie and Ben Affleck drawing media attention to the civil war in the Democratic Republic of Congo; Bob Marley uniting warring factions in Jamaica; John Lennon networking with the new left to oppose Richard Nixon’s re-election; Elvis Presley working with Nixon to counter anti-war activism—he details the role of celebrities working with advocacy groups and lobbying politicians to affect public opinion and influence policy. A series of psychological experiments demonstrate that celebrities can persuade people to accept their policy positions, even on national security issues. Harvey’s analysis of news sources reveals that when celebrities speak about issues of public importance, they get disproportionately more coverage than politicians. Further, his reading of surveys tells us that people find politicians no more or less credible than celebrities—except politicians from the opposing party, who are judged less credible. At a time when the distinctions between politicians and celebrities are increasingly blurred, the insights into celebrity influence presented in this volume are as relevant as they are compelling. Mark Harvey is the Director of Graduate and Undergraduate Programs, University of Saint Mary - Overland Park Campus.